Learning to incorporate and cite sources (aka “research”) in writing can be one of the most important parts of any students' work in a course. But faculty (and students) often struggle with different parts of this process. 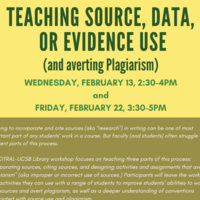 This CITRAL-UCSB Library workshop focuses on teaching three parts of this process: incorporating sources, citing sources, and designing activities and assignments that avert “plagiarism” (aka improper or incorrect use of sources.) Participants will leave the workshop with activities they can use with a range of students to improve students’ abilities to work with sources and avert plagiarism, as well as a deeper understanding of conventions associated with source use and plagiarism.